It seems that almost every home has that one room that is dark, dull and depressing. For some, this might be the bedroom and for others, it might be the living room, but for MOST people, it’s the basement/family room. What can make a room dark? Dark Room Decorating Idea #1 Add some bling baby! Glass, mirror and shiny objects help to move light around the room, whether it’s artificial or natural. If you have too many solid surfaces (wood/fabric/draperies/drywall) that absorb light, rather than reflect it, the energy in your space will feel heavy and off balance – the same thing will happen if you drink too much wine. 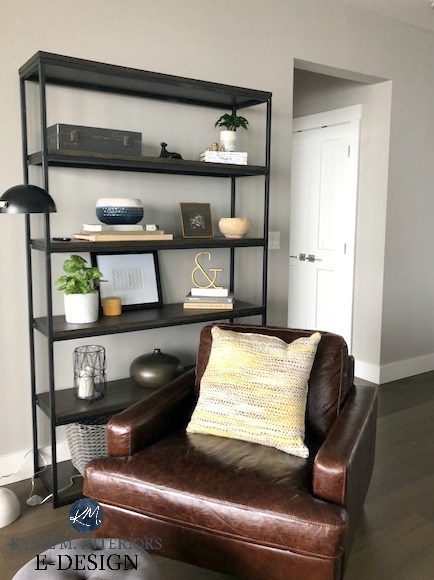 Decorating a bookshelf with wee shiny bits via accessories and vases is a great way to add interest and energy to a dark space – make sure each shelf has some visual interest on it! Mirrors move light around the room and they also ‘act’ like windows. 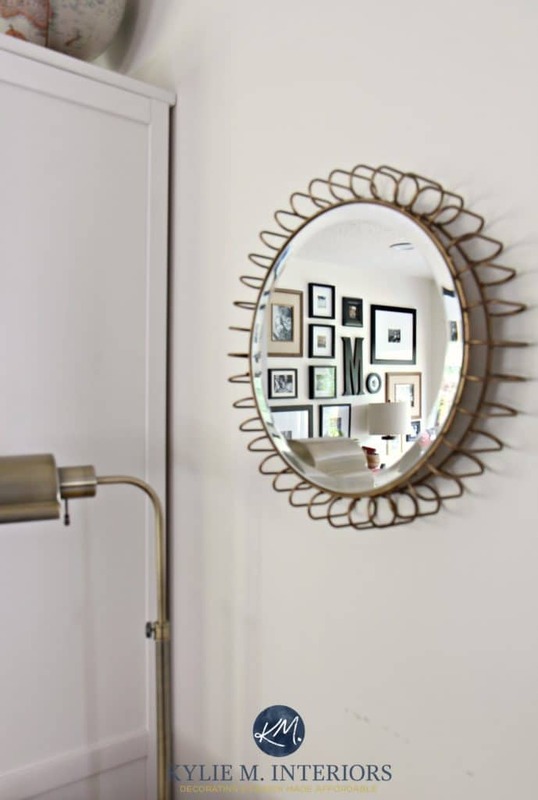 While adding a mirror anywhere in a dark room will help the energy flow, try to place it half-way between your window (if you have one) and the furthest wall. This way the mirror will grab that natural light and throw it to the far end of the room. If you can have your mirror reflecting a light, you will double the value of the light you get! This is great for a dark dining room or bedroom with a hanging fixture. And just so you know, when you’re hanging a mirror (and it’s not above a couch/mantle) the center of the mirror should be approx 62″ from the floor. Dark Room Decorating Idea #3 Brighten Up Buttercup! Get rid of those valances, heavy dark drapes and dowdy old linens. Turf that nappy ole rug, take down those sheer curtains and paint that wood panelling. All of these (and more) will add to the ‘visual weight’ of a room and make it feel darker than it needs to be. In a dark space, it’s important that your light fixtures DON’T have amber/yellowed glass shades. Frosted or clear glass is VITAL. The above light fixtures with their coloured shades aren’t doing ANYTHING for this dark entryway. Block the light in the upper portion of the window and add an ‘eyebrow’ to your window. If not done properly (ie: right fabric, right height) you will only make your room feel oppressive. Heavy drapes that are a lighter fabric are okay as I know drapes are great for privacy, insulation and acoustic value. However, dark and heavy in a dark room only compounds the problem. Lighter linens, toss cushions and throws will add a fresh touch to a dark space. Believe it or not, but sheer curtains cut down on the ‘quality’ of light coming into a room. Whenever I do Home Staging, the first thing I usually say is, ‘open those darn sheers!‘ Okay, maybe I say it nicer than that (but maybe not…). If you live in 2014 then I’m sure you’re aware that fake wood panelling won’t do your home any favours. And while it is a bit of a project, painting this panelling is a heck of a lot cheaper than re-drywalling and will instantly refresh any dark space. Dark Room Decorating Idea #4 Lighten up…literally! Does each light have the right wattage in it? Often you’ll find a 40w in a 60w, check your lights to make sure the wattage is right. Are any bulbs burnt out? Do I have wall lights/sconces that only shine light up or down? 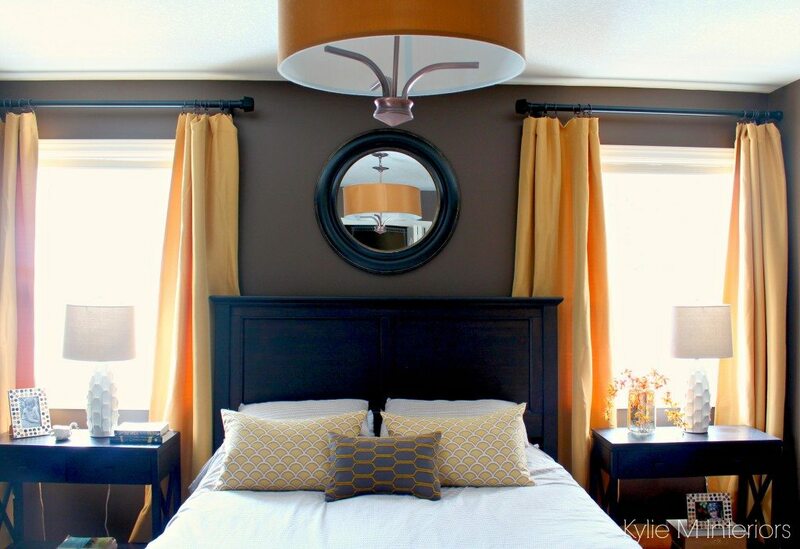 Wall sconces should have glass/fabric shades on them that allow the light to go out – not just up or down. Do I have a honkin’ ceiling fan that only takes 1 bulb? CURSE THESE! I mean who makes a 52″ fan that only handles 1 light bulb – really people! So there you have it! I hope these ideas will help you embrace your dark space and bask in the light! For a custom-tailored Color Consultation, check out my affordable Online Consulting Services! 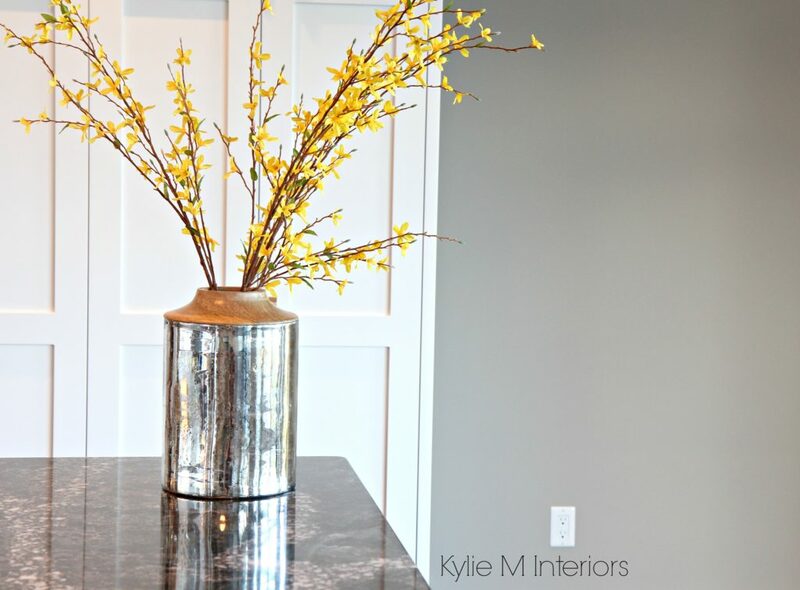 Kylie M Interiors Online Color Consulting and E-Design Services Interior Decorating and Design Blog with Budget Friendly Ideas! Thanks for these very helpful tips. Dare I suggest anything more as if I’m not grateful enough? I’ll just say I would love love to see a post on choosing colors for basement rooms–rooms with some light and rooms with no light. Love your sense of style Kylie, not only in your design but also in your writing! Thanks! Thank you for this great piece! I’ve been looking for some very simple, practical advice for our new dark, north-facing (grey painted – yuk!) dining room, in terms I can understand and this is just the ticket. I will be applying all these tips. Love your sense of humour too. Love your ideas and love your humour, you made me laugh out loud which inspired me even more, thanks! !